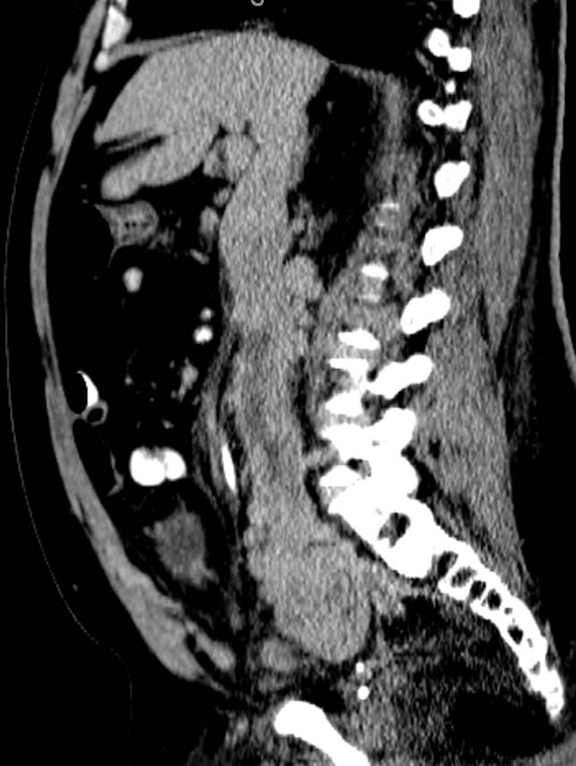 A 57-year-old man presented to the emergency department (ED) with 3 days of sudden onset left-sided flank pain radiating to his back. Past medical history was remarkable for pulmonary embolism with subsequent negative lower-extremity Doppler-ultrasound studies to rule out deep venous thrombosis. Other pertinent history included right anterior cruciate ligament tear, hypertension, hyperlipidemia, and depression. On review of systems the patient recalled bilateral leg swelling for several years, which he attributed to his knee problems. 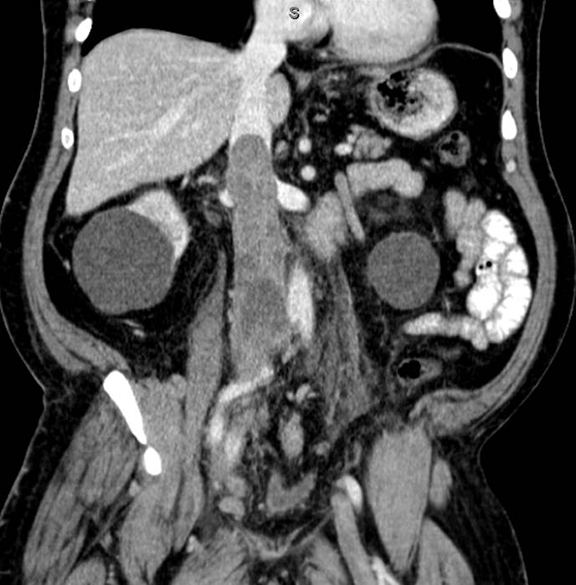 A contrast-enhanced computed tomography (CT) revealed a large right-pelvic mass and adjacent right-iliac lymphadenopathy. Diffuse retroperitoneal inflammation and stranding surrounding the aorta and inferior vena cava (IVC) was noted. There appeared to be direct extension of the mass into the right common iliac vein and infrarenal IVC, which were dilated. A large tubular low-attenuation mass within the lumen of the IVC was concerning for tumor thrombus (Figure 1). 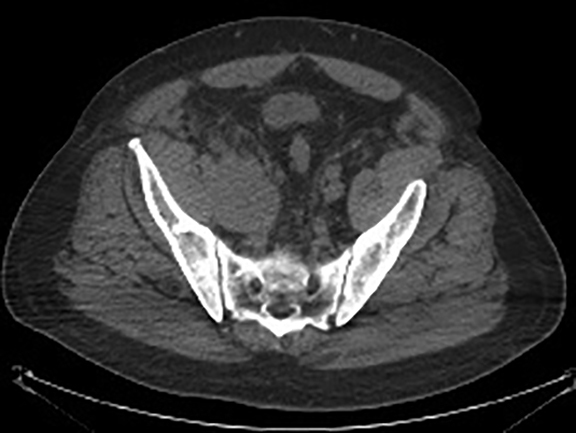 The patient was admitted for further workup, and a CT-guided core biopsy of the pelvic mass was performed indicating high-grade sarcoma of muscle origin. Further imaging with gadolinium-enhanced magnetic resonance (MR) arteriography and venography revealed that the thrombus within the common iliac vein and IVC consisted mostly of enhancing tumor with some scattered areas of nonenhancing bland thrombus (Figure 2). 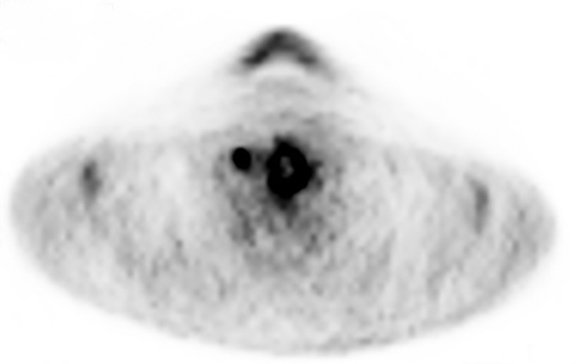 View DiCOM images for Figure 2A here. 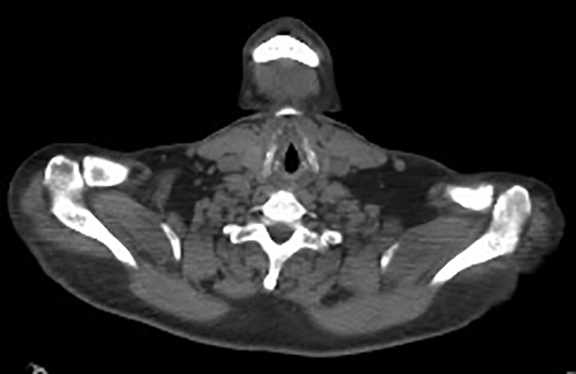 A positron emission tomography/computed tomography (PET/CT) scan performed for staging prior to planned en-bloc resection demonstrated fluorodeoxyglucose (FDG) uptake within the IVC and right common iliac vein consistent with malignancy as well as metastasis to a right supraclavicular lymph node (Figure 3). View DICOM images for Figure 3A-C here and Figure 3 D-F here. Surgical removal of the pelvic mass was attempted, however, only partial removal could be achieved due to extensive intraoperative blood loss(> 6.5 L) from collaterals. A second procedure was performed to remove the involved IVC and thrombus one week later, following delayed primary closure with wound-vac device. Determining whether a sarcoma is of primary intravascular origin versus extravascular origin from a retroperitoneal mass that invades the vessel secondarily, is of paramount importance in guiding appropriate treatment and determining prognosis.2 The differential diagnosis of primary intravenous neoplasms includes retroperitoneal leiomyosarcoma, intravenous leiomyomatosis, endometrial stromalsarcoma, sarcomatoid renal cell carcinoma, angoisarcoma, and hemangioendothelioma.3Treatment via surgical resection with or without adjuvant chemotherapy and radiation is not always curative, with local recurrence rates of 40% to 60%, and poor prognosis with median 3.5-year survival3 and 10-year survival of only 14%.4 Mean survival time in inoperable patients is about 1 month.5 The tumor arises from vascular smooth-muscle cells of the tunica media and may spread endoluminal, extraluminal or both,3 although extraluminal growth predominates.5,6 With extraluminal growth-pattern leiomyosarcoma is difficult to distinguish from other retroperitoneal masses. Another diagnostic challenge is that bland and tumor thrombi can coexist.9 The presence and extent of tumor thrombi influences staging and treatment, and may sometimes render patients unsuitable for surgical resection.10 The high rate of recurrence and dismal prognosis associated with tumor thrombosis make it all the more important to distinguish between bland thrombus. Tumor thrombus can be caused by primary tumor arising from the vessel wall as in leiomyosarcoma or by extension from an adjacent organ—most commonly in renal cell carcinoma, hepatocellular carcinoma, adrenocortical carcinoma, or retroperitoneal metastasis.5 The distinction between bland and tumor thrombus necessitates contrast enhancement whether in CT or MR cross-sectional imaging. By exploiting the inherent metabolic differences between tumor and bland thrombi, FDG-PET can be useful in this regard. Due to increased cellular density and altered nuclear-to-cytoplasmic ratio, neoplasms typically display restricted diffusion and decreased apparent diffusion coefficients.10 Recent studies have shown significantly higher apparent diffusion coefficient in bland thrombi versus thrombi in hepatocellular carcinoma on diffusion weighted images10 and even suggest DW imaging can be used as an alternative to contrast enhancement for thrombus characterization. A recent study utilized a maximum standard uptake value (SUV) of 3.63 to differentiate tumor thrombosis from benign thrombus with a sensitivity of 71.4% and specificity of 90%.23 Our patient demonstrated intravascular maximum SUV of 5.6, however, one should be cautious of relying on absolute cut-off values of FDG uptake, which can vary significantly between patients and scans. More studies should be performed in this regard. Certainly the use of PET in this patient further defined the extent of vascular involvement, allowing for better surgical planning. In addition, distant metastatic disease was found in a right supraclavicular lymph node, which increased disease staging. Thus, in this particular patient, PET was instrumental in treatment planning. 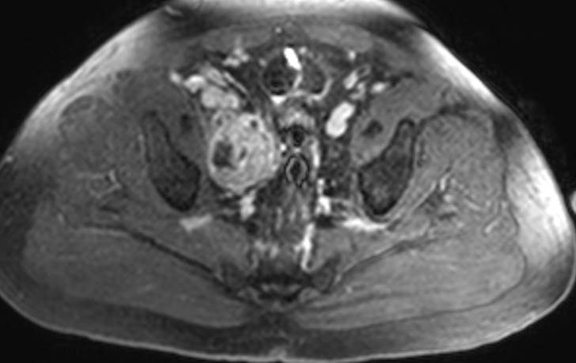 Although rare, intravascular neoplasms present a diagnostic challenge that can be met by utilizing multiple imaging modalities.Cross-sectional imaging with contrast-enhanced CT or MRI is paramount in diagnosing primary venous leiomyosarcoma, in differentiating tumor from bland thrombus, delineating intraluminal growth versus extravascular disease extension, and determining extent of disease, which influences surgical approach. 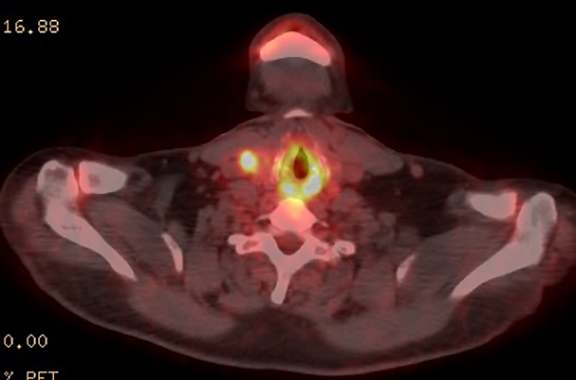 FDG-PET with CT can confirm malignant involvement versus bland thrombus, and is instrumental in disease staging by detecting distant metastasis, thus influencing treatment planning. Using various modalities at the diagnosticians disposal can lead to more accurate diagnosis and guide the most appropriate therapy. Hollenbeck ST, Grobmyer SR, Kent KC, Brennan MF. 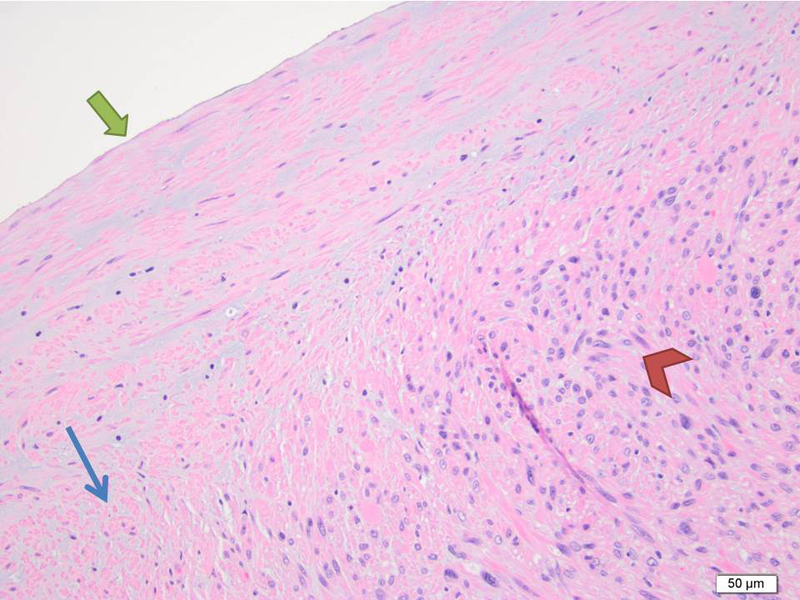 Surgical treatment and outcomes of patients with primary inferior vena cava leiomyosarcoma. J Am Coll Surg. 2003 Oct;197:575-579. Webb EM, Wang ZJ, Westphalen AC, Nakakura EK, Coakley FV, Yeh BM. Can CT features differentiate between inferior vena cava leiomyosarcomas and primary retroperitoneal masses? Am J Roentgenol. 2013;200:205-209. Oliveira, N, Dias E, Lima R, et al. 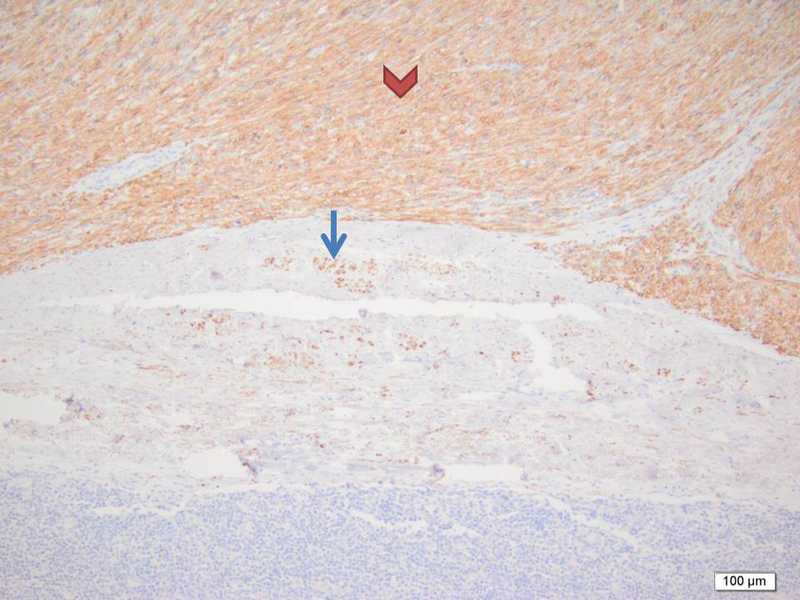 Primary iliac venous leiomyosarcoma: A rare cause of deep venous thrombosis in a young patient. Case reports in Medicine. 2011:1-5. Sheth S, Fishman EK. Imaging of the inferior vena cava with MDCT. Am J Roentgenol. 2007;189:1243-1251. Cuevas C, Raske M, Bush WH, Takayama T, Maki JH, Kolokythas O, Meshberg E. Imaging primary and secondary tumor thrombus of the inferior vena cava: Multi-detector computed tomography and magnetic resonance imaging. Curr Probl Diagn Radiol. 2006;35:90-101. Khosa F, Magoon P, Bedi H, Khan AN, Otero H, Yucel K. Primary and metastatic vascular neoplasms: Imaging findings. Am J Roentgenol. 2012;198(3):700-4. 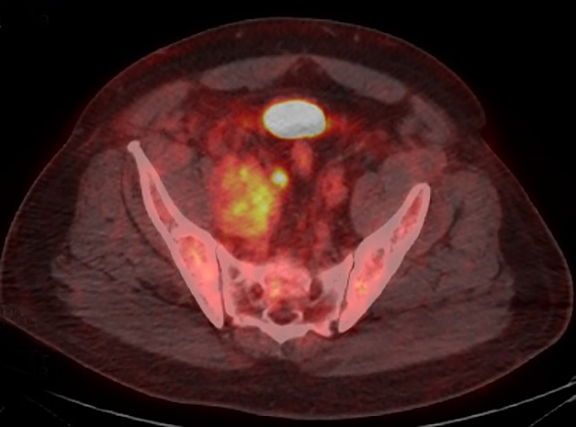 Nishino M, Hayakawa K, Minami M, Yamamoto A, Ueda H, Takasu K. Primary retroperitoneal neoplasms: CT and MR imaging findings with anatomic and pathologic diagnostic clues. Radiographics. 2003;23(1):45-57. Shah ZK, McKernan MG, Hahn PF, Sahani DV. Enhancing and expansile portal vein thrombosis: Value in the diagnosis of hepatocellular carcinoma in patients with multiple hepatic lesions. Am J Roentgenol. 2007;188:1320-1323. Kaufman LB, Yeh BM, Breiman RS, et al. 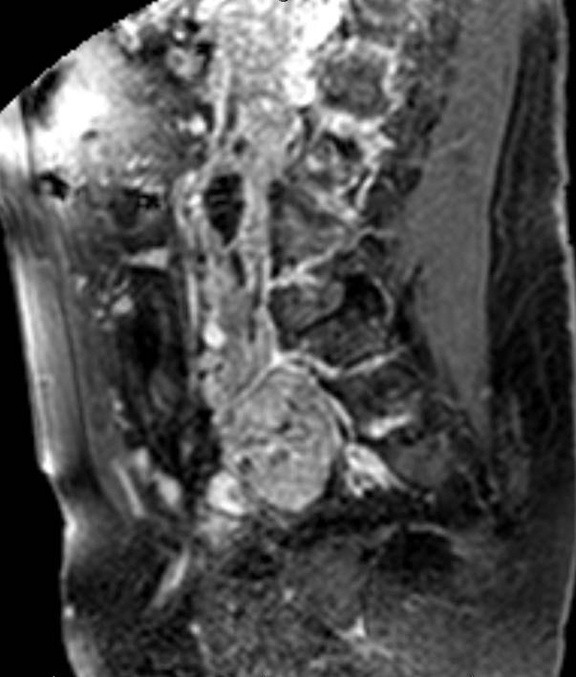 Inferior vena cava filling defects on CT and MRI. Am J Roentgenol. 2005;185:717-726. Catalano OA, Choy G, Zhu A, Hahn PF, Sahani DV. Differentiation of malignant thrombus from bland thrombus of the portal vein in patients with Hepatocellular carcinoma: application of diffusion-weighted MR imaging. Radiology. 2010;254:154-162. Engelbrecht M, Akin O, Dixit D, Schwartz L. Bland and tumor thrombi in abdominal malignancies: Magnetic resonance imaging assessment in a large oncologic patient population. Abdom Imaging. 2011;36:62-68. Tilkorn DJ, Hauser J, Ring A, et al. 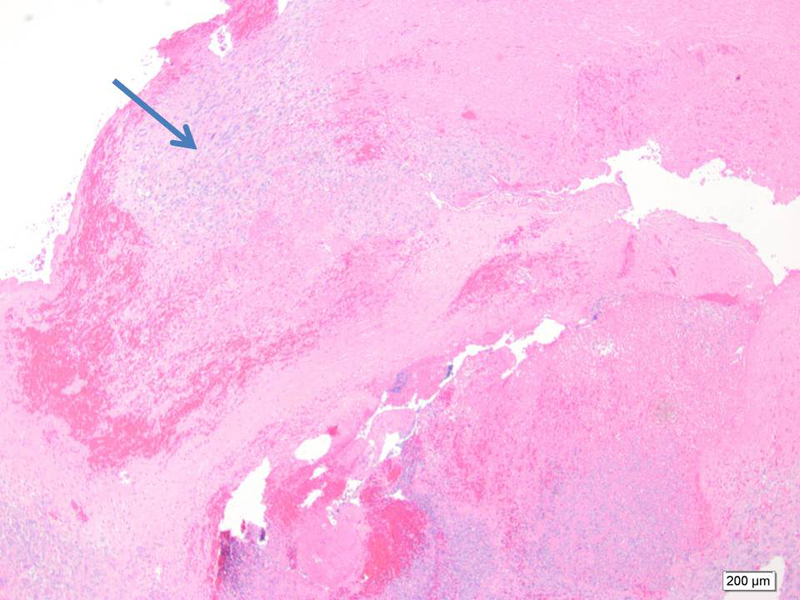 Leiomyosarcoma of intravascular origin—a rare tumor entity: Clinical pathological study of twelve cases. World J Surg Oncol. 2010;8:103. Nguyen BD. Pancreatic neuroendocrine tumor with portal vein tumor thrombus: PET demonstration. Clin Nucl Med. 2005;30:628-629. Snow D, Cohen D, Chapman WC, Grubb RL. 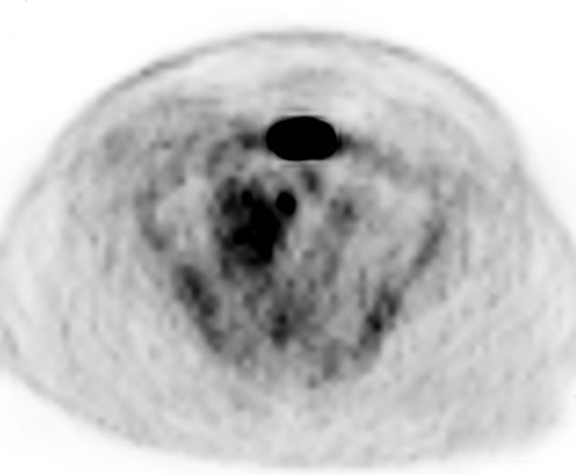 Positron emission tomography enhancing tumor thrombus in patient with renal cell carcinoma. Urology. 2009;73:270-271. Probst S, Seltzer A, Chachoua A, Friedman K. Azygos venous tumor thrombus from renal cell carcinoma detected by F-18 FDG PET/CT. Clin Nucl Med. 2010;35:832-833. Senthil R, Mittal BR, Kashyap R, et al. 18F FDG PET/CT demonstration of IVC and right atrial involvement in adrenocortical carcinoma. Jpn J Radiol. 2012;30(3):281-283. Gupta P, Kramer EL, Ponzo F. FDG uptake in tumor thrombus in inferior vena cava from rectal cancer on positron emission tomography. Clin Nucl Med. 2005;30:342-343. Aras M, Dede F, Dane F, Aktas B, Turoglu HT FDG PET/CT appearance of portal vein tumor thrombus in the gastric primitive neuroectodermal tumor: Uncommon primary tumor site with rare finding. Clin Nucl Med.2013;38:47-49. Park JW, Kim JH, Kim SK, et al. A prospective evaluation of 18F-FDG and 11C-acetate PET/CT for detection of primary and metastatic hepatocellular carcinoma. J Nucl Med. 2008;49:1912-1921. Lee EY, Khong PL. The value of 18F-FDG PET/contrast-enhanced ct in detection of tumor thrombus. Clin Nucl Med. 2013;38:e60-65. Valls E, Garcia JR, Rodriguez R, Soler M, Moragas M, Lomeña F.Detection of pulmonary tumor thrombosis by integrated 18F-FDG PET/CT scans with intravenous contrast. Rev Esp Med Nucl Imagen Mol. 2013;32:49-51. Sharma P, Kumar R, Jeph S, et al. 18F-FDG PET-CT in the diagnosis of tumor thrombus: Can it be differentiated from benign thrombus? Nucl Med Commun. 2011;32:782–788. Primary venous leiomyosarcoma: Cross-sectional imaging modalities, including CT, MRI, and F18-FDG PET/CT. Appl Radiol. Prepared by Dr. Graf while at the State University of New York at Buffalo, NY; and by Dr. Esfahani and Dr. Arshad while at the VAMedical Center in Buffalo, NY.